When Savannah Lynn Curtis comes into his life, John Tyree knows he is ready to turn over a new leaf. An angry rebel, he had enlisted in the army after high school, not knowing what else to do. Then, during a furlough, he meets Savannah, the girl of his dreams. The attraction is mutual and quickly grows into the kind of love that leaves Savannah vowing for John while he finishes his tour of duty. But neither can foresee that 9/11 is about to change the world. Like so many proud men and women, John must choose between love and country. Now, when he finally returns to North Carolina, John will discover how love can transform us in ways we never could imagine. 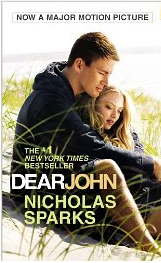 Dear John is such a touching, heartbreaking story that I really enjoyed. I've only read The Last Song from Nicholas Sparks, and I loved that one, so I wanted to check this one out. Just a warning, if you check this one out, grab a box of tissues. You might not cry a lot, but I certainly teared up at parts of this story! Especially at the end, that just made me sad. Plot- The plot was good, it wasn't the best I've ever seen, but I still liked it. I found it a little slow at times and hard to get through, yet when I did get through them, there were parts I really liked. This book definitely isn't fast-paced and intense, but I liked taking my time with reading it. The plot definitely earned a few tears from me, so that is why I said to have a box of tissues near you, but I wasn't given the warning! To the people that don't like books that make you cry, this book isn't one that has you crying constantly, but only some times. I definitely disagreed with the ending of the novel. Nonetheless, I thought it was very touching. (That's all I'm saying, you have to read this book to find out what happens!) So, I guess I didn't exactly love the plot, but I didn't hate it. Characters- I had mixed emotions with the characters. I was annoyed by a few and I loved a couple of them. Nicholas Sparks always does a great job with the development of the characters, so I really liked that. Favorite Character- It would have to be a tie between John and his dad. The dad was so cute, I felt really bad for him! Least Favorite Character- I didn't like Savannah, she annoyed me. 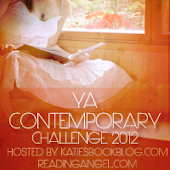 I questioned a lot of her choices around the end of the book, and that's probably when I started to get annoyed by her. Writing- I really like Nicholas' writing, he always does a great job with his books. I want to read more books by him, he has a ton, and I especially want to read The Notebook. His books are really popular, and I understand why. Both young adults and adults are interested by his writing because he is such a good author. Cover- Well, the book I read had the movie tie-in cover, so I'll talk about that one. I like the cover, it's cute. I want to see the movie to see how well they did with it, but I've always loved Channing Tatum. He's so adorable! This was a great read, I think many people will enjoy it. I had mixed feelings about it, but that doesn't mean that other readers will also. I recommend people to go check it out! First Sentence: What does it mean to truly love another? 1. Plot- 16 out of 20 points. 2. Characters- 12 out of 15 points. 6. Ending- 12 out of 15 points. 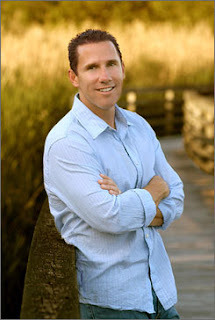 With well over 50 million copies of his books in print, Nicholas Sparks is one of the world's most beloved storytellers. His novels include eight #1 New York Times bestsellers, and all his books, including Three Weeks with My Brother, the memoir he wrote with his brother, Micah, have been New York Times and international bestsellers, and were translated into forty languages. Six of Nicholas Sparks's novels--Dear John, The Last Song, Nights in Rodanthe, Message in a Bottle, A Walk to Remember, and The Notebook--were also adapted into major motion pictures. The author lives in North Carolina with his wife and family.